Buy new Blue Jays and parts at Allen Boat Co. Attention, all Blue Jay sailors. Bill and Julie Dunbar have retired! Hobie Sailor of the Month - October, 2012 . 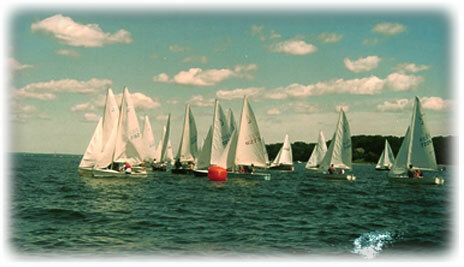 The Pettipaug Yacht Club (https://www.pettipaug.com/) has an extensive sail racing program starting each season on the day of the club’s Commissioning in mid-May through Decommissioning in late October. At the core of PYC’s program is the One Design Class Regattas open to any dinghy class with three boats or more in the same class. This includes Blue Jays which are alive and well at Pettipaug Yact Club in Essex, CT! Depending on the wind and weather conditions, five to eight races are held. Awards are given out at the end of the day, and hot dogs, hamburgers and sodas are served. Bring the family for an afternoon of FUN! Sign-up with a Fleet Captain and call a friend! Spread the word to assure there are enough boats in your class to participate. Please support a grass-roots effort to renovate Blue Jay sailboats and put them in the hands of young ladies where they will be used 7 days a week for the entirety of the summer. So whether you wish to encourage women entering the sport, wish to support dingy sailing, or are a fan of Blue Jays, please join the cause! Two boats have been brought back from the edge of euthanasia, completely renovated, and are now in use with new running rigging, new sails, new positive flotation, and an automatic bailer. A third boat is in the works and is slated to enter service July 14. The dream is to establish a fleet and then host a Blue Jay Intergalatic Championship. Please note: the Class Association is in the process of reorganization.